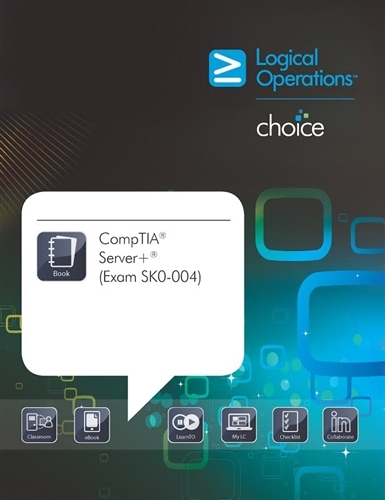 Logical Operations CompTIA Server+ (Exam SK0-004) Student Print Courseware includes standard instructor-led training (ILT) courseware from Logical Operations , which is preferred by instructors and students alike because of its superior instructional design, an electronic "e-Book" version of the instructor-led training (ILT) courseware; HTML versions of instructor-led training (ILT) courseware for any mobile device that supports a web browser; interactive resources designed to reinforce course material; and detailed evaluations designed to identify competency gaps and validate comprehension. Logical Operations print courseware is preferred by instructors and students alike because of its superior instructional design, complete mapping to exam objectives, and the availability of supplemental content in multiple modalities created using single-source development. Logical Operations Print Courseware available exclusively through Logical Operations , provides standard instructor-led training (ILT) courseware; interactive resources designed to reinforce course material; an electronic "e-Book" version of the ILT courseware; HTML versions of the ILT courseware for any mobile device that supports a web browser; and detailed assessments designed to identify competency gaps and validate comprehension. This course is designed for IT professionals such as PC, desktop, and help desk technicians who have experience supporting PC hardware who wish to make the transition to become server hardware and support specialists. This course is also designed for existing server managers who are preparing to take the CompTIA Server+ Exam SK0-004.